Twenty-nine goals is not even half the story. In a terrific night of Champions League football, sublime scorers relished, the Emirates saw a three-goal comeback, Real Madrid were pushed at the Bernabeu and more. With games starring Group A-D, and 29 goals scored on Tuesday, here is all the roundups and breakdowns. Goals on either half from Koke and Raul Garcia ensured that the Spanish Champions kept in the mix for qualification after patiently side-stepping Malmo. A clockwork-like goal provided the breakthrough for the Spaniards after half-an-hour. Juanfran surged down the right, whipping the ball in for Koke to slot away with a lovely finish, flicking it on with his heel. Atletico would take some time to register a shot in the second half, but when they did they made it count. 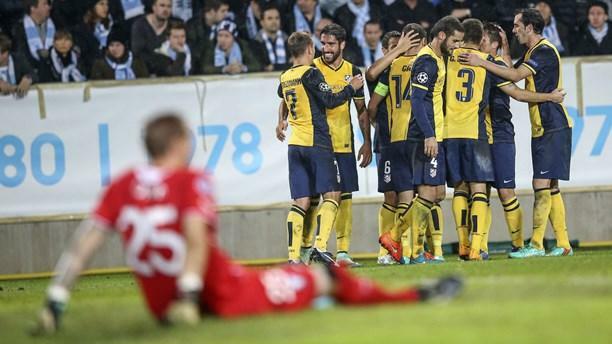 Raul Garcia swept in a deflected cross to double the lead and eliminate any nerves as they took their slender lead. Juanfran's cross was not cleared well allowing Garcia to drill it straight into goal, as Atletico sealed the three points. Paul Pogba's scintillating stunner lifted Juventus over Olympiacos in a thrilling, goal-filled game to keep their group chances alive and beating. Andrea Pirlo found himself standing over a free-kick after twenty goalless minutes. In his 100th Champions League appearance, he marked it in style scoring a spectacular free-kick. It fizzled into the top corner and the Italian gave his side a crucial lead. It wouldn't last long though. Olympiacos' Botia managed to beat Chilleini to head home the equaliser. Juventus got their marking all wrong and he glanced a header past Buffon. David N'Dinga dealt the Italains a huge setback after the hour mark when he powerfully thumped his header straight into goal. But the craziness would not end there. All of a sudden, things would swing back in the favour of Juventus. After Roberto's own goal, Paul Pogba would set Europe alight with a screamer to make it 3-2, lifting the roof off the place in Turin. Controlling Llorente's cross, his first shot was stopped before his second shop was unstoppable. Arturo Vidal's penalty was saved in the 90th minute but it wouldn't matter as Juve marched on to the win. Basel bolstered their chances in group B as they outclassed Ludogorets in a win that sae everything click together. Breel Embolo provided the Swiss side with the opener after he controlled Frei's lobbed ball, chesting it away from the defender as he trekked into the box, before guiding it past the keeper. Adding a second just a few minutes from the interval provided a major boost for Basel as Gonzalez latched onto a long ball, controlling it then sweeping it right past the keeper. Shkëlzen Gashi added a third for Basel as they really took control. Embolo found him at the backpost and the rest was simple. Marek Suchy added a fourth with the game already won. Deflecting onto his path from a corner kick, he simply hit it past the keeper and an easy night for Basel got easier. Santiago Bernabéu Stadium, Madrid, Spain. A 27th minute strike from Karim Benzema was enough for Real Madrid to hold out against a courageous Liverpool effort. Karim Benzema's goal from close range after less than half-an-hour would unravel a positive start from the visitors. Fielding a weakened side as Sterling, Gerrard, Coutinho and others were on the bench, Liverpool had fun playing the ball around and looked defensively resolute. But, in a flash, Real Madrid's Benzema was found from the left and it was simple enough for him to slide it in. Liverpool remained composed in defence, but going forward they were hesitant and could've created some big chances. Rodgers could have been pleased with his side after the first half. The introduction of Sterling and Gerrard caused more threats, Liverpool came closer yet not close enough, they ended up losing after an encouraging performance. Petrovsky Stadium, St Petersburg, Russia. A second half brace — over the course of a definitive five minute spell — from Song Heung-Min helped Bayern past Leverkusen in the early kickoff in Russia. Following a goal-less half, the visitors would take until the 68th minute to really find the goal and put their dominance in writing. Son-Heung Min's sensational curled attempt, after Bellarabi's layoff from a free-kick, finally paved the way for a long awaited goal. Bayer Leverkusen's No.7 would add to his tally just five minutes later. Kriessling's swift link-up with Bender unlocked space for Song Heung-Min, this time having a successful crack at goal from outside the area to double the lead. After some searching St. Petersburg found a response, even though it proved to be too little too late, as Rondon slashed a terrific volley when he was helped on by Ryazantsev. Ultimately, the Germans held on for the win. Estádio da Luz, Lisbon, Portugal. A last-gasp goal from Talisca saw Benfica prevail in a dull encounter with Monaco. Benfica pressed for most of the first half, but Raggi blocked a big shot from Gaitan on the stroke of halftime. Monaco did ease into the game but it was the hosts who were dominating, without a goal to show for it at the interval. Arsenal were left shocked to the core after they saw a three-goal lead fall apart in the second half as the Belgian Champions Anderlecht fought back to claim a point at the Emirates. Mbeba conceded a penalty in the 25th minute, as he took down Danny Welbeck in the box to give the Gunners a penalty. Mikel Arteta stood up and caressed it to the right corner as the Emirates erupted. Arsenal's Alexis Sanchez continued his unstoppable form with an unstoppable finish four minutes later. After seeing his free-kick bounce off the wall, it came straight back at him and he replied with a drilled half-volley. The Gunners sealed their victory when Alex Oxlade-Chamberlain surged down the left after Sanchez picked up the ball with a tackle. Chamberlain turned his body towards goal and curled it past the keeper. With Arsenal's focus down, Anthony Vanden Borre swept in at the other end to pull one back, albeit negligible, as the ball was squared across for him to simply poke in towards goal. 11 minutes later, Vanden Borre scored from the penalty spot to set up for some late nerves. After Monreal fouled Mitrovic in the box, he sent Sczcesny the wrong way to put Anderlecht back into it. In the 90th minute, as Arsenal brought out their defences, Andy Najar found Mitrovic for a stunning equaliser making it 3-3. The look on the faces of Arsenal supporters said it all. Dortmund continued their marvellous Champions League form with a win over Galatasaray as goals from Reus, Immobile and others saw Jurgen Kloop's side flourish once again. After finally managing to get past the "bus" parked that the official Dortmund referenced on Twitter, Marco Reus broke past some woeful defending, with a possible offside in all, to tuck it past the oncoming keeper. Reus may have been well offside but the goal still stood. While Marcos Reus' Emoji celebrations took over the Internet, it was Papastathopoulos who added a second after the break. As the header from a corner bounced towards the keeper, the Greek centre-half got to the ball before and edged it towards goal. Hakan Balta put the game back into contention for the Turks however, as he met Sneijder's inswinging cross with a huge header that was always going into goal. Ciro Immobile extinguished any threats when he finished off a rampant counter attack from the men in yellow. Aubameyang and Mkhitaryan set it up on a plate for the substitute to register his goal. Things would really crumble for Galatasaray when an own goal was scored to make up Dortmund's fourth. Immobile's attempt came off Kaya and trickled into goal as Galatasaray went on the verge of crashing out of the tournament. Malmö 0 - 2 Atlético Madrid: It was a nice, tactical win for Diego Simeone's men. Managing to score on their first shot of the second half is testament to how they can keep the game in their favour and their defence is sturdy. Juanfran was particularly fascinating to watch, as he enjoyed plenty of space down the right wing and any time he sent a ball in, there was trouble caused. Juventus 3 - 2 Olympiacos: Probably the game of the night, and undoubtedly the goal of the night, either Pirlo's free-kick or Pogba's screamer. Olympiacos once again showed their tough spirit that has allowed them to make great strides in the tournament so far, but this time Juventus were spurred on by their fans in Turin to get a massive result. Real Madrid 0 - 0 Liverpool: For a weakened team, Liverpool set out strongly on a mission and Toure and Moreno were particularly impressive. Yet, the error that lead to the goal, knowing they restricted big chances would have left them with a bit of regret in the first half, also knowing they could have had a few of their own if they were more steadfast in sending balls into the box. At the end of the day its a loss, a really good performance, no disgrace, but now work to be done. Zenit 1 - 2 Bayer Leverkusen: A goal-less first half provides enough of the opinion on most of the game. Both teams hardly set out to attack but took a more conservative approach. Eventually though, Zenit taking their foot of the gas momentarily cost them. Knowing he could hit them, Song Heung-Min delivered two strikes that could have been hacked down with better defending. Zenit's response was not good enough. Three victories for Leverkusen out of four games, impressive. Benfica 1 - 0 Monaco: This was quite a dull one, barring the final few minutes. A massive boost for Benfica to get a late winner, and Monaco who seemed to inconsistently switch in their game output ended up falling at one of the last hurdles. Arsenal 3 - 3 Anderlecht: Simply incredible. Anderlecht hearts were broken at the hands of Arsenal last time round, and at the Emirates on Tuesday it was the polar opposite. For Arsenal to throw away a three-goal lead highlights that their defence may not be cut out to it. Also for it to occur at home is a travesty, there is a lot to look at following this, but they still are in the enviable possession of some comfort in their group. Dortmund 0 - 0 Galatasaray: Borussia Dortmund continue to impress... at least in the UEFA Champions League. Their Bundesliga form should be excluded from this paragraph just to embrace their brilliance against Galatasaray. Marco Reus gets his goal, Dortmund just dominate. They are one of the forces to be reckoned with in Europe. Matchweek 4, Part I is in the books. As per, it was a night of sensation, and a night that has plenty of questions to be answered. Bring on the next batch of action. Please give me your thoughts on the article, the events and any news tips in the comment box below! A complete recap for the Champions League group games contested on Tuesday 4 November 2014.